You never know which books and ideas are going to stick with you. I first read Filters Against Folly in the early 1990s. Once a month, the group I was with met for lunch and discussed a book we thought might be interesting. I wish I could remember how this book got on the list. I’ve given away multiple copies and continue to find its approach relevant. Some of the specific examples are dated and I think Hardin goes too far in some of his later arguments. What has stuck with me, however, is the value of the perspective Hardin adopts and the process he advocates. There is a cult of ignorance in the United States, and there has always been. The strain of anti-intellectualism has been a constant thread winding its way through our political and cultural life, nurtured by the false notion that democracy means that ‘my ignorance is just as good as your knowledge’. Hardin offers a practical way out of this dilemma. We need not simply defer to expertise, nor reject it out of hand. 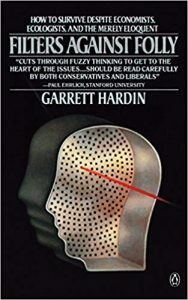 Rather than focus on the experts, Hardin shifts our attention to the arguments that experts make and three basic filters anyone can apply to evaluate those arguments. When looking at the language in advocacy arguments, the key trick is to look for language designed to end or cut off discussion or analysis. Of course, in today’s environment, it might seem that most language is deployed to cut off thinking rather than promote it. Hardin offers up a provocative array of examples of thought-stopping rather than thought-provoking language. Shifting to numbers, Hardin does not expect us all to become statisticians or data analysts but he does think we’re all capable of some basic facility to recognize the more obvious traps hidden in expert numbers. That includes numerate traps laid inside expert language. In Hardins estimation “the numerate temperament is one that habitually looks for approximate dimensions, ratios, proportions, and rates of change in trying to grasp what is going on in the world.” Both zero and infinity hide inside literate arguments that ought to be numerate. The Delaney Amendment, for example, forbids any substance in the human food supply if that substance can be shown to cause cancer at any level. That’s a literate argument hiding zero where it causes problems. The numerate perspective recognizes that our ability to measure improves over time; what was undetectable in 1958 when the Delaney Amendment was passed is routinely measurable today. The question ought to be what dosage of an item represents a risk and is that risk a reasonable or unreasonable risk to take on? Hardin’s final question “and then what?” is an ecological or systems filter. In systems terms we can never do merely one thing. Whatever intervention we make in a system will have a series of effects, some intended, some not. The responsible thing to do is to make the effort to identify potentially consequential effects and evaluate them collectively. To be effective in holding experts to account, we must learn to apply all three of these filters in parallel. For example, labeling something as an “externality” in economics is an attempt to use language to treat an effect as a variable with a value of zero in the analysis. For a small book, Filters Against Folly offers a wealth of insight into how each of us might be a better citizen. The questions we face are too important to be left in the hands of experts, no matter how expert.